Pre-order offers you to get the network at a minimal donation of 5 € instead of 10 € after this period. You will also have access to the network on Friday, March the 29th 2019 instead of Friday, April the 12th 2019. Pre-order will close at 23:59 on 28/03/2019. Please read carefully the following elements before clicking on the link at the bottom of this page. What will be included ? - A total of 429 km (267 miles) of lines forming a huge network. - The 155 km (96 miles) East-West Line from Floeta to Stelbrak via Tarna. - The 170 km (106 miles) North-South Line from Toletha Jn (on the EWL) to Xeristoh and Hokenah. - The 35 km (22 miles) of HSL from Vanarda Jn to Stelbrak 2V (+30 km of HSL running along the East-West Line). - The 20 km (12 miles) line from Floeta to Urnadov and Floeta-Koroleva. - The 16 km (10 miles) line from Nalasdoga (on the EWL) to Luzhanska-Lezhisjo. - The 10 km (6 miles) branch line from Vagzhara Jn (on the NSL) to Zhenskeldava. - The 10 km (6 miles) line from Floeta to Floeta Intermodal Freight Port. - The 6 km (4 miles) line from Stelbrak Central to the HSL. - The 5 km (4 miles) of the Tarna freight loop. - The 2 km from Kalorag Cement Works to Markhorod Junction. - Several small freight or industrial sections. - 68 stations (including 5 major stations with 7 platforms or more (up to 15 at Tarna)). - More than 1800 signals. - 9 large depots (7 for passenger trains, 1 for freight train) including washing facilities and fuel points. - 1 marshalling yard (Floeta). - Floeta Intermodal Port with docks and facilities allowing complex freight operations. - More than 2 400 km (1 500 miles) of tracks. - Signal dynamic numbering : every signal is numbered according to its signal center. - Kilometer points : every portion of the line is identified with kilometer points, allowing drivers to run (thanks to included working sheets) without the HUD. - A reworked tunnel occlusion and enhanced scenery along large portion of the lines (especially on the HSL and the oldest portion of the line, between Floeta and Tarna). - A large number of scenarios depicting the complexity of train operations on the network. This will include passenger, freight and empty stock services. - Scenarios will use the best available UK trains for TS 2019, with a heavy use of AP Enhancement Packs. But what if you don't have an extensive collection of trains ? No problem, several scenarios will be included with a "complete" version and a "light" version, that will have the same requirements as the network. - Some scenarios will exist in different copies, but each copies will lead to different events during the run. You won't be able to know what, just like a real train driver ! 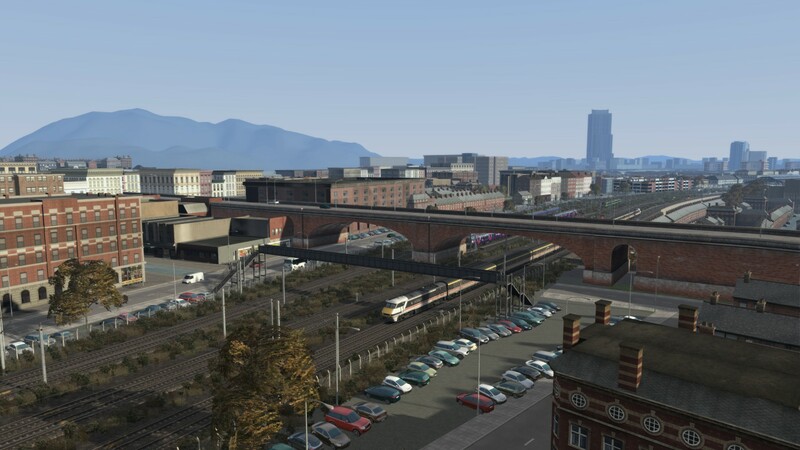 -All scenarios will be made according to the complex timetables and rolling stock sheets we have built for the network. Absolutely nothing will be the result of something random. What will I need to run the network ? * This routes are absolutely required to ensure the network will work without problems. Other routes are only used for the scenery. The network will be available on Friday, March the 29th 2019. RKP East-Sansek is a huge personal work that began in 2009 with Rail Simulator. We aim to provide quality content for TS users for free. But with such a huge work, we also want to make it useful for the community, and that's why we will release that project in a particular way. I (the owner of this website) am deeply affected by the suicide prevention cause, because I lost several friends and members of my family this way, and also because I am also affected by suicidal thoughts or crisis. I continue to work on my projects, to make my professionnal and family lives as good as possible, but I really want to make something for the french association Suicide Ecoute (which is like the Samaritans in UK). That's why I chose to make this network "temporary donationware". To obtain the download link, you have to make a donation of at least 5 € (4.35 £) on the HelloAsso Campaign Page during the preorder period, after that, the minimal donation to get the network will be 10 €. After you make the donation during the preorder period, you will receive an email to confirm the transaction. Once the network is released, you will then get the link, by email, to download it. If you make the donation after the preorder period, you will get an email with the link within 48 hours. This system will run for six months. After six months, Suicide Ecoute (which is the administrator of the campaign on HelloAsso) will receive automatically the entirety of your donations. They will then payback 15 % of the amount to the website RailSim.fr - the most popular website and forum about TS in French language, and also the website that helps me the most during the construction of my network - and 10 %. This will be used to cover the costs of this website hosting. How could I be sure that my money will effectively go to Suicide Ecoute ? As Suicide Ecoute is hosting the charity campaign on HelloAsso, they will automatically receive your donations. We are only administrators of the collect, so we can't make anything with the money collected. HelloAsso is totally free and won't charge us to make this campaign. They won't charge you with transaction fees, but you can add a tip to help us continuating their activities. What are the benefits of making my donation during the 'preorder' period ? You will have to make a smaller minimal donation to get access to the network (5 € instead of 10 €, but you can give as many as you want). You will also get the network 2 weeks before anybody else, as the other users will have to wait for mid-april to get the network. And what if I don't want to pay / I can't pay by internet ? After six months, in October 2019, the download link will be available here, and you will be able to download the network for free. CHARITY COLLECT LINK : CLICK HERE .